Volker Berghahn, Seth Low Professor of History, specializes in modern German history and European-American relations. He received his M.A. from the University of North Carolina, Chapel Hill (1961) and his Ph.D. from the University of London (1964). He taught in England and Germany before coming to BrownUniversity in 1988 and to Columbia ten years later. 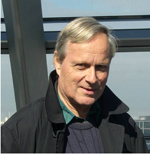 His publications include: America and the Intellectual Cold Wars in Europe (2001); Quest for Economic Empire (ed., 1996); Imperial Germany(1995); The Americanization of West German Industry, 1945-1973 (1986); Modern Germany (1982); Der Tirpitz-Plan (1971); Europe in the Era of Two World Wars (2006); and most recently Industriegesellschaft und Kulturtransfer, Goettingen (2010).